Depression: 4 FAQ’s – Cause? Relief? Friend? Counseling? This post is meant to offer guidance to common “What now?” questions that could emerge from Pastor J.D.’s sermon on Lamentations 3:1-33 addressing the subject of depression preached at The Summit Church Saturday/Sunday August 11-12, 2018. In this post we will reflect on four frequently asked questions related to depression. How can I know if my depression is primarily caused by a malfunction in my body-brain or wrongs I’m committing in my beliefs-behaviors? Another way to ask this question would be, “Is my depression something I am doing or something that is happening to me?” There is no universal answer to this question. That is like asking, “How much do lifestyle choices contribute to the cause of diabetes?” For some people a great deal, for others very little. The two leading treatments for depression tell a conflicting story: cognitive-behavioral therapy (CBT) and psychotropic medications. The effectiveness of CBT indicates that beliefs and behaviors play a large role in depression. The effectiveness of medication indicates that body malfunctions, particularly in the brain or glandular systems, also play a large role. 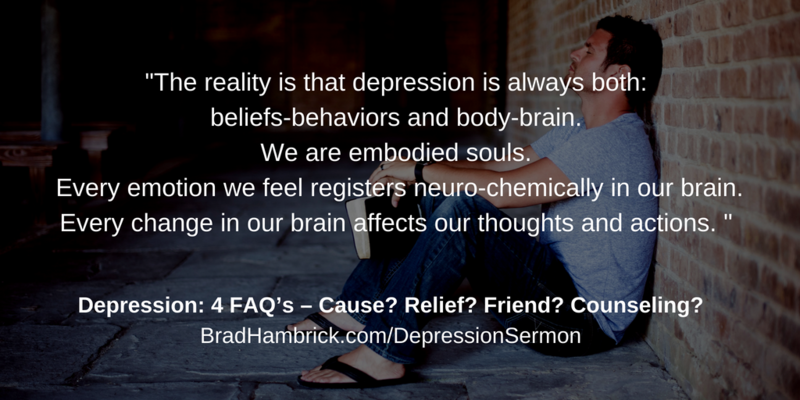 The reality is that depression is always both: (1) beliefs-behaviors and (2) body-brain. We are embodied souls. Every emotion we feel registers neuro-chemically in our brain; this is true of pleasant emotions (i.e., joy, excitement, and peace) and unpleasant emotions (i.e., depression, anger, and anxiety). Every change in our brain affects our thoughts and actions. Consider how you think-move in the morning before coffee. There is a long list of things that can cause depression (i.e., a persistent down mood and/or the inability to enjoy normal pleasures): a significant loss, failure, lack of purpose, unrealistic expectations, temperament, glandular malfunctions, chemical imbalances, certain diseases, response to some medications, change in seasons, fatigue, isolation, sin or idolatry, unbelief, foolishness, legalism… (the list could continue). The follow up question would be, “How can I tell if my experience of depression is rooted primarily in my beliefs-behaviors or my body-brain?” Here is a process to help you with this discernment – 6 Steps to Wise Decision Making on Psychotropic Medications. If I am struggling with depression, what are some basic things I need to do to get some relief? Begin by sharing your struggle with a trusted Christian friend. We read in I Kings 19:10 how believing that you are alone with the experience of despair magnifies the emotion and false messages of depression. Isolation is a repeated theme in Scripture when it describes the experience of depression (Psalm 88:18). There is nothing like allowing someone to care for you to break the isolation and stigma that often comes with depression. Regulate your diet, exercise, and sleep patterns. Depression will make its home in your lifestyle choices and stay until you kick it out. Diet, exercise, and sleep are not just “healthy choices;” they are the natural way our bodies regulate our brain-chemistry. Long before the availability of SSRI’s (Selective Serotonin Reuptake Inhibitors) people combated chemical imbalance in these ways—even if they didn’t understand neurology, they knew a healthy diet, cardiovascular exercise, and regular sleep helped them feel better. Even with modern medicine, we should not force medication to sustain a neural-balance that our lifestyle is fighting against. If I have a friend who struggles with depression, how can I be a more effective friend and encourager? Listen well without assuming your “instinctual explanation” of depression is accurate. We all have a default explanation for emotional experiences. It may come from our own experience, our “common sense,” or a favorite book. But when you listen do not force your friend’s experience into your assumption. Allow whichever of the causes (likely plural; review the list in question one) that best-fit your friend’s experience to be the cause. Just because something “worked for you” doesn’t mean it will work for your friend. Be content to “walk with” rather than “fix” your friend. It is likely the “solution” will not be easy. To rush to a premature “answer” is both ineffective and insulting. As you get to know your friend’s experience better and narrow down the causes; you may or may not feel competent or comfortable addressing them. Legalism or performance-driven overworking are easier for most Christians to address than the side effects of a new medication or a hypoactive thyroid. Regardless, remain an actively listening friend even if you encourage your friend to see a counselor or doctor. Your presence and care have a powerful impact on removing the isolation and stigma associated with depression even if you are not the “advice giver.” Good advice without authentic, personal relationships is limited in its effectiveness. Your role as friend will outlast whatever role a counselor or doctor may play. It would also be good for you to read some of the resources listed above. Depression is a common experience we all need to be skilled in addressing and these resources will equip you to echo important truths into the life of your friend. 1 Minute VLOG: How Can We Disciple a Friend Who Struggles with Anxiety or Depression? Mentoring vs. Counseling: What’s the Difference? If my struggle with depression persists and I wanted to seek counseling, who would you recommend? If you are in the RDU area, we have several options to serve you through The Summit Church. G4 Group on Depression – This is a free, peer support group ministry at Summit that has groups for depression and many other life struggles. Summit Counseling Graduate Intern Program – This is free counseling with students completing their masters or doctoral degree in counseling. Bridgehaven Counseling Associates – Bridgehaven provides a context to receive counseling from a full-time, experienced counselor on a donation basis. Bridgehaven offers a high quality of care that is both clinically-informed and consistent with the teaching of The Summit Church. Related Question: How would the counseling provided by a formal pastoral counselor compare to a licensed counselor? Related Question: How do I know if my life struggle merits counseling? If you are outside RDU or prefer to pursue other counseling options, here are some helpful guidelines from CCEF on how to find a good counselor and guidance for finding a counselor in your city.